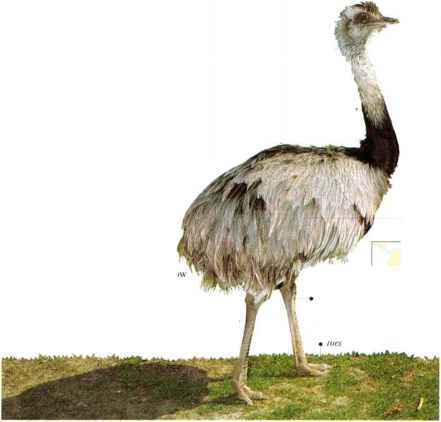 I his large, flightless bird lives on open plains, particularly where grass is tall and hushes are plentiful. I lere it feeds on the leaves, roots, and seeds of plants, together with insects and other small animals. Although it never flies, the Greater Rhea comes nearest to doing so when it races over the open grassland, holding its wings up to gain a very slight lift. 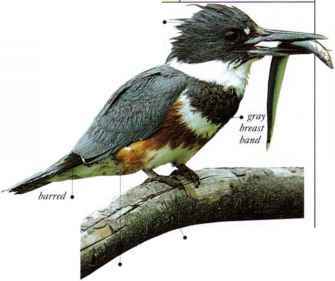 It can also swim, and flocks visit lakes or rivers to drink and to bathe. This species is always sociable except that some older males live alone. In the breeding season, rival males fight, mainly by kicking with their powerful legs. Males also display, either I deter rivals or to attract females, ruffling their wings and uttering low, roaring calls. A male normally mates with several females, which he then leads to his nest. I Ip to a dozen females will visit the same nest, normally producing 15 to 30 eggs, sometimes more than 60. The male incubates the eggs alone, covering as many as he can, and cares for the downy young. • Nest a shaik hollow in the ground, sparsely lined with grass.